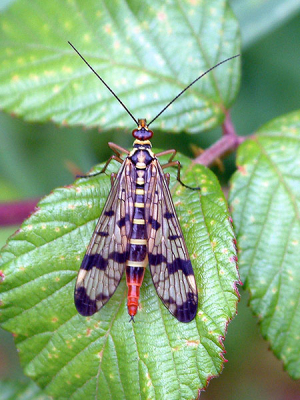 Observation - Scorpion Fly (female) - UK and Ireland. Description: Female Scorpion Fly found on Bramble leave at the entrance to Walton Hall's flower Meadow. Female Scorpion Fly found on Bramble leave at the entrance to Walton Hall's flower Meadow.